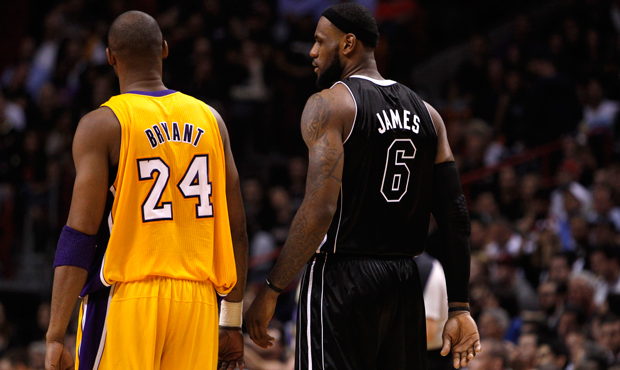 Miami Heat's LeBron James speaks with Los Angeles Lakers' Kobe Bryant during a game on January 19, 2012. The media's stereotypical portrayals of race have obscured reality in sports. Such hard-to-believe facts contradict what so many Americans imagine they know based on what they see on TV. After all, this is a sports-crazed nation, and what sports fan doesn’t watch ESPN—and especially its popular “SportsCenter” program—where black people areoverrepresented as athletes and announcers? The sports media industry doesn’t have to say explicitly that black athletes dominate sports. They just show an endless highlight reel of slam dunks and touchdown runs, and the pictures speak for themselves.